The World Series of Poker has finally announced their full schedule for the 2015 edition of the tournament series, revealing a schedule of 68 gold bracelet events, including one that is dramatically different than any WSOP event ever played before. The schedule includes 11 new events, covering a wide range of formats and buy-ins, as well as deeper starting stacks for players across the board. The new tournaments that have been added to the schedule includes the $565 Colossus that has a $5 million guaranteed prize pool. But the other new events offer an interesting mix of prestigious, high buy-in contests and more affordable options that should draw plenty of amateurs to the Rio this summer. There’s the $25,000 High Roller Pot Limit Omaha tournament, which will begin on June 29, and the $10,000 Dealers Choice event, which will allow players to choose from a record 19 poker variants on each orbit. Casual players might like a $1,000 Hyper No-Limit Hold’em tournament that will be played in just two days, or the $1,500 50/50 tournament that is apparently sponsored by daily fantasy sports site DraftKings, in which half of the field will be paid. But while these tournaments may draw some reaction from players, they’re relatively standard options compared to the final new bracelet event: an online tournament that will be held on WSOP.com in Nevada. For the first time ever, players will be able to compete for a bracelet over the Internet, with the $1,000 buy-in No-Limit Hold’em tournament beginning at noon on July 2. The tournament won’t be held entirely on the site: the final heads-up battle will take place at the Rio on July 3, which shouldn’t be a problem, as players will have to be in the state to play on the website anyway. Few details are available on this tournament at this time, though the WSOP says a more complete breakdown of the event will be available soon. 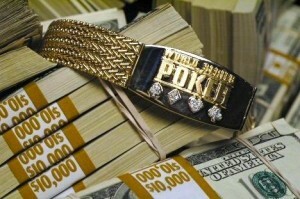 The WSOP also announced changes across the board to the structure of their bracelet events. Almost all of the lower buy-in tournaments (those that cost less than $10,000 to play in) will now start players with deeper stacks, with most events seeing a 66 percent increase in starting chips. Two new levels have been added to the structures of most tournaments as well in an effort to extend play somewhat for players. The complete WSOP schedule comes just days after the World Series announced chances to their Main Event structure, responding to reaction from players who felt the initial plan for poker’s biggest tournament was faulty. WSOP officials announced that they were scrapping the $10 million guarantee for first place, and would instead guarantee that 1,000 players would make the money in the tournament, and that every player who reached the final table would win at least $1 million.